Chemists can now use a powerful mobile tool inside and outside of the laboratory to quickly and conveniently get reliable chemical information and enhance lab productivity. 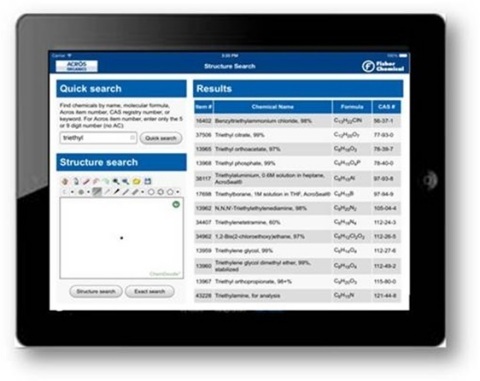 The new ChemSearch mobile app features the intuitive mobile chemical drawing technology, ChemDoodle® from iChemLabs™, designed to enable scientists to easily draw and search chemical structures to identify the right chemicals and compounds required for their work. ChemSearch is ideal for any chemistry discipline, academic, pharmaceutical, life science research, biopharmaceutical and industrial laboratories. Available for Apple iPhone® and iPad® devices, ChemSearch provides access to a broad range of Acros Organics fine chemicals. The app features a periodic table, chemical specifications, physical properties and MSDS safety information. Users can search using a variety of inputs, including drawing, chemical abstract number or product number. Thermo Fisher Scientific Inc. is the world leader in serving science, with revenues of $17 billion and 50,000 employees in 50 countries. Our mission is to enable our customers to make the world healthier, cleaner and safer. We help our customers accelerate life sciences research, solve complex analytical challenges, improve patient diagnostics and increase laboratory productivity. Through our four premier brands – Life Technologies, Thermo Scientific, Fisher Scientific and Unity Lab Services – we offer an unmatched combination of innovative technologies, purchasing convenience and comprehensive support. For more information, please visit www.thermofisher.com.